W.E.B. DuBois was one of the earliest civil rights activists to raise his voice about the mistreatment of African-Americans. Because of his smart writing and tireless work, people began to take the issue of civil rights seriously. Learn more about this influential American with this Historical Heroes worksheet. Get inspired: there are more Historical Heroes worksheets here. Learn more about Eleanor Roosevelt, an amazing American woman, with this "Historical Heroes" worksheet. 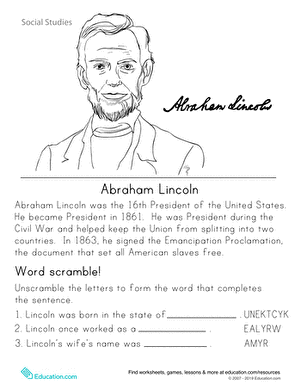 Learn about one of our nation's historical heroes with this social studies worksheet featuring Abraham Lincoln. Learn more about one of the most admired African-American heroes with our Historical Heroes worksheet on Booker T. Washington. Learn more about this brave woman named Rosa Parks our "Historical Heroes" worksheet about her. If your child loves to be in the spotlight, help inspire her with this Historical Heroes worksheet about African-American playwright Lorraine Hansberry.